Just before sundown on Friday 19th June 1953, Julius and Ethel Rosenberg were sent to the electric chair in New York’s Sing Sing prison, accused of passing atomic secrets to the Soviet Union. Proclaiming themselves innocent, to the point of martyrdom, right up to their deaths, the couple were the first American citizens to be executed for espionage. That they were sacrificial lambs to McCarthyism is generally undisputed, but a further twist to the case was that it rested on the testimony of Ethel’s brother, who decades later told reporters that he lied to protect his own family. With name changes for dramatic licence, their haunting true story is the basis of James Phillips’ “The Rubenstein Kiss”, which takes its title from the famous photograph of the Rosenberg’s kiss in the back of the prison van before their execution. 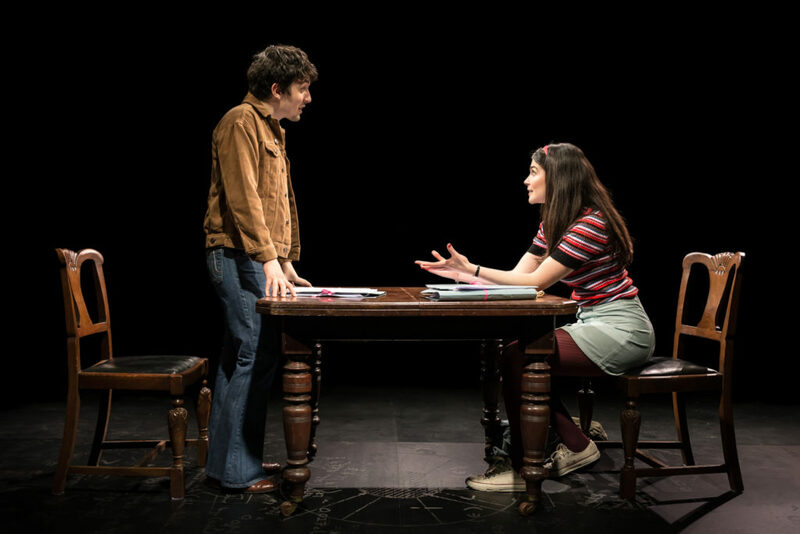 The fictionalised version of the photograph hangs in an art gallery in the mid-seventies; where young law student Matthew (Dario Coates) meets, seemingly by chance, history teacher, Anna (Katie Eldred). From this, again seemingly, light-hearted vignette of the courting couple we are suddenly swept back to Esther and Jakob Rubenstein’s starkly furnished New York apartment in 1942. What follows is an utterly compelling and thought provoking two hours of theatre. The essential beauty of Phillips’ play is that it perfectly combines the brutal political and social impact of the historical facts with a profound and deeply moving study of two connected families across two generations. The dialogue shoots straight to the heart of the characters’ innermost concerns, showering us with the impossible questions about morality, loyalty, betrayal, truth and patriotism at such a divisive time in America’s history. The urgency of the writing is matched by an outstanding cast across the board. Henry Proffit and Ruby Bentall, as Jakob and Esther Rubenstein, both capture the unwavering passion and blind resolve of the doomed ideological couple; Bentall quite simply riveting in her final scenes under interrogation by Stephen Billington’s cool, chilling yet ambivalently sympathetic FBI agent, Paul Cranmer. Sean Rigby’s sensitive portrayal of the traitorous brother saves him from villainy and, like his fiancé, Rachel Lieberman (Eva-Jane Willis) shows that the choices we are forced to make are never clear cut. In fact, collectively the entire cast allow the audience the freedom to make their own conclusions. Under Joe Harmston’s vital direction, the interlocking strands of the narrative, aided by Matthew Bugg’s swooping sound design, seamlessly cut between the forties and the seventies. Dario Coates and Katie Eldred as the young lovers brilliantly depict their struggle to find their own identity, frantically looking for a truth that can help explain the past. This production grips throughout, and while being a truly enthralling history lesson, it is essentially a haunting, poignant, sublimely crafted and superbly acted piece of theatre.